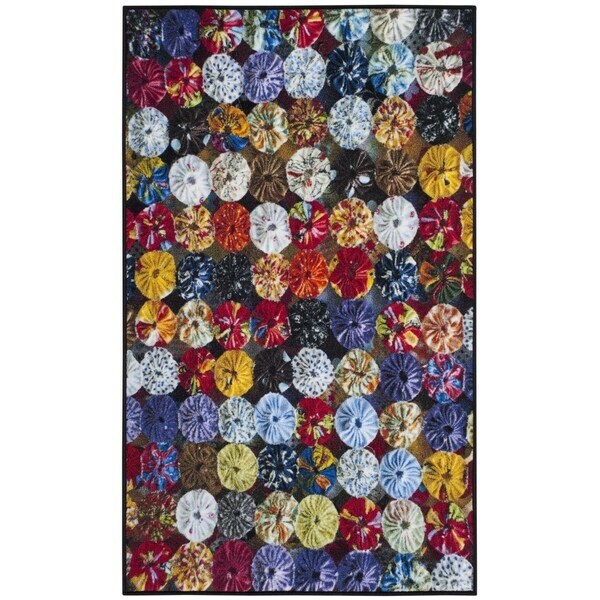 Could hardly believe it when I accidentally came across the Overstock picture of this rug. It is a beautiful colorful rendition of a YoYo quilt. My daughters, mother, sister and I all love sewing YoYo circles with scraps of fabric to make beautiful quilts, wall-hangings, table decorations and trim on clothing and linens. Thank you Overstock for this gorgeous rug. It would be perfect in any room where a bright happy look would be welcome. This 3'x5' is in my kitchen by the sink. It lays flat, has a rubber backing which doesn't slip and is comfortable underfoot. The 2'3"x8' runner I ordered today will be in the kitchen entry hall and the 2nd 3'x5' in the adjacent laundry room. Don't know yet if that one will be hung on the wall above the washer and dryer or placed on the floor in front of them. The room is all white and this will add warmth and color. There is no odor. The colors are true to the listing picture. Shipping was fast and packaging was in extra heavy double plastic wrap which survived the seasonal heavy shipping crush just fine. Happy Holidays everyone! This was exactly what I was looking for. I love how it brightens the room. Love The material & how it looks on tile. It's bright and cheery ! Livens up my bathroom. The Curated Nomad Chaves Hand-tufted Chocolate Aztec Wool Area Rug - 3'3" x 5'3"